In may not be December 21st yet, but for most parts of the country, winter is in full swing. Which means it’s a great time to re-evaluate some of your preventative safety measures around the workplace. Wet and icy conditions bring with them a much greater chance for slip and fall injuries around the workplace. In order to reduce these risks, you have to have the safety measures in place to prevent them. Many are turning to anti-slip floor tape (traction tape) to help alert and prevent workers from such accidents. Accidents are going to happen, but like many accidents, slips and falls are preventable with the right measures. Anti-slip tape is an effective measure to help prevent these types of accidents and is extremely affordable. In most slip and fall cases the common cause is either a loss of traction between the shoe and walking surface or accidental contact with a fixed or moveable object, which leads to the fall. The beauty of anti-slip floor tape is that it can combat all of these causes of slips and falls in the workplace. Having anti-slip tape installed around the facility will alert anyone walking by that a slip hazard is present and protect them against possibly injuring themselves, or worse. It should be no surprise that the winter season creates the most hazards around the workplace, especially in areas that experience extreme temperatures and above average rainfall. Installing anti-slip floor tape should be on top of your to-do list if you live in any of these places. I would recommend installing the tape in all your entry ways and areas exposed to mother nature to help alert workers and reduce their risk of injury. The team at Creative Safety Supply has recently released a glow-in-the-dark anti-slip tape that will help to reduce slips and falls with the lights on or off. The new tape will provide you with all the benefits of their other traction tape, but will also glow-in-the-dark for up to eight hours! For those that work in low-lit areas, this is the perfect solution to help keep you safe and on two feet. The tape can also be extremely beneficial in the event of a power outage. If installed prior to the outage, the glow tape would provide important sensory information in dark corridors or pathways to exits that do not have access to natural light. It may seem trivial to go and install anti-slip tape around your facility, but it could also be the difference in your employee’s safety. There is no limits to what you can do with the tape and because it is one of the cheaper preventative safety tools you can buy, the sky is the limit. Take the time today to analyze and re-evaluate your facility before it’s too late. 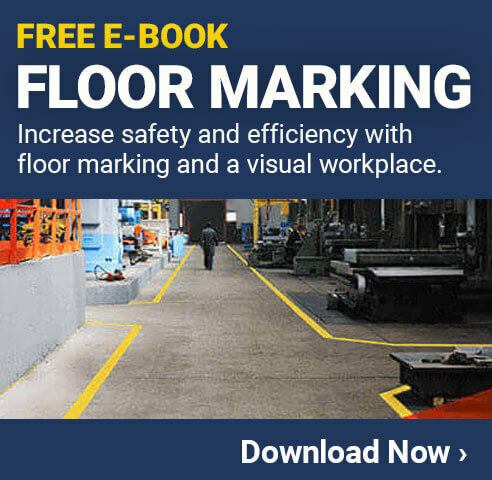 Look for the signs of potential threats and hazards around the workplace that could be most susceptible to slips and falls and take the initiative by installing anti-slip floor tape today.